Not that we've been through a slump over the past couple of years, but we're really being treated to some amazing pop music in 2012. I've said it before and I'll say it again now: golden age. And the pick of the pop pile is This Many Boyfriends. For the uninitiated: This Many Boyfriends hail from Leeds and last year released the classic debut single 'Young Lovers Go Pop!' on Angular Records before their guitarist tragically passed away. 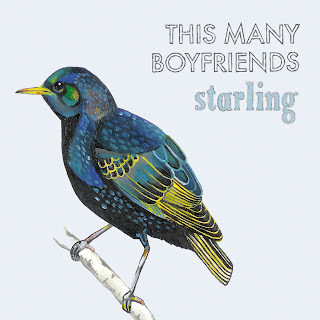 'Starling' is their follow up to this single and is out in time to coincide with their forthcoming tour. And as you can tell from the singles status as Track of the Week it's ace. Snappy fun guitar pop it recalls both Art Brut and The Wedding Present whilst sounding distinctly like TMB. The vocals are to the fore and with plenty of memorable and quotable lyrics. Less instant than their previous single, it's nonetheless incredibly catchy and potentially deserving of the same classic status. The “ba-ba-ba-da” backing vocals towards the end of the single ensure that it leaves us on a positive sounding note, which is appropriate for what is a sweet and lovely single.